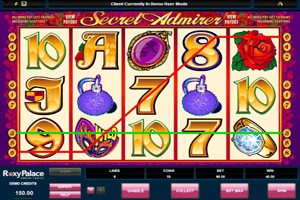 Secret Admirer is a pleasant and a simple video slot machine that is all about love and romance. This is why players will see that the red color of love is the color that dominates the entire interface of the game. This includes the background, the control panel and the symbols that appear spinning on the game’s reels. These symbols include a heart shaped cake, a red rose, a wild mask, a beautiful medallion, a diamond ring and card symbols that come surrounded with flowers and jewelry. Play Secret Admirer Slot here. These symbols all come in top notch visuals and they will appear spinning on the game’s 5 reels and the nine lines that players are invited to place their wanted stakes on. These options are the coin value, the coin number and the number of lines that players want to activate. The game also has the max bet button, which players can click on so they can easily place the biggest bet and spin the reels at the same time. The Wild mask is one of the special symbols of the game. It has the ability to substitute for any other icons on the reels of the game in order to help players get pad. There is also the scatter icon which is the diamond ring. It can give great pays while triggering the free spins round. The slot also has a gamble feature that allows players to increase their payouts.